Seven weapons (three melee and four ranged), like the Mace, Blaster and Hand-cannon. Dead Meets Lead’s Captain gets more furious as he kills more zombies. The more he kills the angrier he gets. Keldyen Interactive calls this the rage system. Sixteen maps with terrain ranging from sandy beaches, to swamps and villages, and in-land mountain ranges. Eleven different types of enemies (including three bosses); from the common zombie and their infected cattle to mysterious mystic beings living on the islands. 40+ Dead Meets Lead Game achievements. Custom made in-game soundtrack with enthralling tunes by composer Nikolas Sideris from North by Sound. With Halloween approaching, how can gamers get into that Halloween spirit? How about playing 2010’s ten best ghoulish games? This action-adventure by Konami features platforms and puzzles. Fight traditional ghoulies like vampires, werewolves, trolls and goblins. Less scary than satisfying, CAPCOM’s addictive games finds creative ways to destroy hordes of zombies. Whether slicing through crowds with hand-held lawnmowers or flaming them with water guns and gasoline, this game taps into your inner badass handyman. NAMCO Bandai’s Splatterhouse could be the goriest survival horror game of the year. Available November 2010, it might miss Halloween, but will be worth the wait. Players control the hero Rick as he attacks monsters with makeshift weapons like meat cleavers, or rips them apart with his bare hands. In Frictional Games’ first-person survival horror game, use brains, not brawn. Escape gruesome creatures without any weapons to defend yourself. Contains advanced physics-based puzzles and a strong storyline. A third-person action-adventure, you play one of the four horsemen of the Apocalypse through platforms and puzzles. Working your way from a sword to projectiles, you maintain balance in the final battle between heaven and hell. The underwater environment that comprises much of BioShock 2 gives the game a creepy and slightly unnerving quality rather than an all-out gorefest. Perfect for Halloween, and one of the year’s best games. Psychological thriller Alan Wake is the perfect suspenseful experience for Halloween season. An episodic adventure about a best-selling writer whose characters and plots come to life – except he can’t remember writing the book. Completely absorbing, perfect for long dark nights. World of Warcraft is perfect – there’s a Hallow’s End in-game event every year in which everyone goes pumpkin crazy and fights the Headless Horseman. A light-hearted Halloween experience. The Alien and Predator films are Halloween staples, and Aliens vs Predator is a great nostalgic indulgence, as well as being full of gore and carnage. For jaded adults, retro gaming is a great way of getting back Halloween terror, through nostalgia. The Ghosts n Goblins games are almost as old as gaming, and this is a solid continuation of the knights’ battle against various demonic hordes. “Nightmare Adventures: The Witch’s Prison” is a first person puzzle game with a truly breathtaking horror movie style twist. Boasting beautiful graphics and an endless array of horror themed locations and storyline styles, “Witch’s Prison” has the potential to be a best seller with Halloween drawing ever closer. # 2 – Unique horror themed storyline. # 3 – Reminiscent of vintage first person puzzle games. #1 – Somewhat short, basic and conventional horror storyline. #2 – Perhaps too similar to vintage titles of the same genre. # 3 – Older computer models may struggle to run it. As the cold winter months are due to set in and Halloween right around the corner, one of the games that could truly become an instant classic this year is Nightmare Adventures: The Witch’s Prison. Boasting truly beautiful graphics, well made horror-themed music and an endless amount of eerie settings and surroundings that could make your skin crawl, the game’s best points are also reflected by the vintage and classic puzzle style gameplay reminiscent of such first person puzzle titles as the legendary “Myst” series. The game play of The Witch’s Prison is fairly simple. After receiving a letter giving her details on her unknown family, Kiera Vale traverses on an adventure to the creepy Blackwater Asylum which is in a peculiar state of uproar. Using a simple first person point and click interface, the player has to find hidden items and locations, use equipment to solve puzzles and use their general knowledge and common sense to make progress in the Asylum in search of the truth in regards to her family history. The graphics are potentially the most beautiful aspect of the game. With high quality first person locations, everything from the background settings, items and equipment alike are made in an eerie horror style that can prove to send a shiver down your spine with ease. The music again is something that is flawless. Boasting a horror themed soundtrack, the music of The Witch’s Prison keeps you on the edge of your seat when combined with the graphics and storyline, thus creating a truly eerie and adrenaline fueled atmosphere. 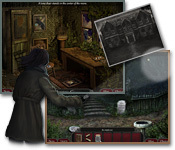 When it comes to games that could rise to prominence and popularity in the 2010 year, “Nightmare Adventures: The Witch’s Prison has the potential to be a highly successful downloadable game with the cold winter months due to set in and with Halloween being just one short month away. With truly flawless graphics and a unique combination of horror-themed music that can keep you on the edge of your seat, the well-written storyline combined with the addictive puzzle style gameplay is something that can keep you occupied for days. With a reasonable price tag of $6.99, The Witch’s Prison is a beautiful bargain of a game that players and enthusiasts of the gaming and horror worlds should certainly not pass up. Amnesia: The Dark Descent is, simply put, perhaps the scariest game of all time; a carefully crafted environment, a scary soundtrack, and a gameplay infused with horror elements such as chasing monsters and loss of sanity, coupled with puzzles to whittle away precious time allows for a truly intense horror experience. Action gamers and the faint-of-heart might want to look elsewhere. # 3 Strong horror elements; the game ensures the gamer will never know what’s around the corner, be it merely another puzzle, or a lurking monster. Horror enthusiasts and puzzle masters rejoice; there hasn’t been an environment as scary or as hard to navigate as the dark castle crafted by Frictional Games in Amnesia: The Dark Descent. Waking up as Daniel, an amnesiac (as the title implies), in a dark, scary castle, with a mysterious creature hunting you at every turn, the task falls upon you to discover more about your past, and that of the castle you find yourself in; a story that is immersive and haunting as more is revealed. The horror elements set into the games are strong; monsters hunt you constantly, ending your trek abruptly if you ever find the misfortune of being slow enough to be caught. Other than the carefully crafted gore in the prevalent setting, including blood and the ever-prominent skeleton, the lighting system itself adds to the ever-present tension in the atmosphere and presents a tough gameplay choice as well; although Daniel can see as well in the dark as he can in light, there are inherent dangers in either choice. Daniel possesses a tinderbox he can light torches and other lighting devices with; but the visibility of light, although providing relief, attracts various monsters. Stay in the dark, however, and Daniel slowly loses his sanity; haunting images start appearing on the screen, and the overall effect, especially when coupled with his surroundings, is unsettling to say the least. Puzzles provide relief from the horror, but comes with inherent dangers as well; slow down enough or fail a few puzzles, and the monsters slowly catch up to you, ending your brief trek of exploration. If you’re a horror enthusiast seeking the most horrifying, terrifying, and immersive environment possible, then Amnesia: The Dark Descent is your game. Definitely not for cowards, the faint of heart, or people with heart conditions. You’ve been warned. Frictional Games released Amnesia The Dark Descent today for $20.00. Its available in Windows, Mac and Linux. We will post a review in the next few weeks.